This is the fifth part of our cPanel Tutorial Series. If you are setting up a new VPS, then we recommend starting with part 1. In this chapter, we show you how to upload your website to your VPS. To upload your site, you can use FTPS or the cPanel File Manager. CPanel offers useful tools to quickly install a CMS system. We explain the installation of WordPress, Drupal and Joomla with these tools at the bottom of this article. Websites often use an SQL database. In this section, we show you how, in addition to uploading your website, you also create a database and import your existing database into it. Don’t use a database for your website? Then after uploading your site, directly proceed to chapter 6 to set up your email. CPanel uses phpMyAdmin for managing databases, but before you can use phpMyAdmin and import your database, you must first create a database. We explain how to install your own SSL certificate or Let's Encrypt in cPanel in this article. WHM / cPanel is automatically configured to use FTPS. You do not need to make any configuration changes and you can start using FTPS out-of-the-box. Should you experience a problem, it's always a good idea to first check if port 21 is open and if passive ports are configured. 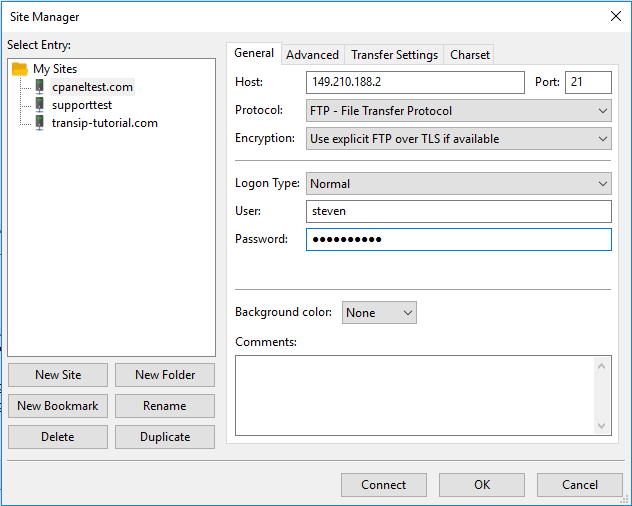 FTPS is more secure than FTP and uses an SSL connection. CPanel automatically uses self-signed certificates for this FTPS connection. Further information about FTP, FTPS, SFTP and related terms can be found in our article on the differences between FTP, FTPS en SFTP. We use the FileZilla program in this manual and recommend using FileZilla to follow these steps one by one. 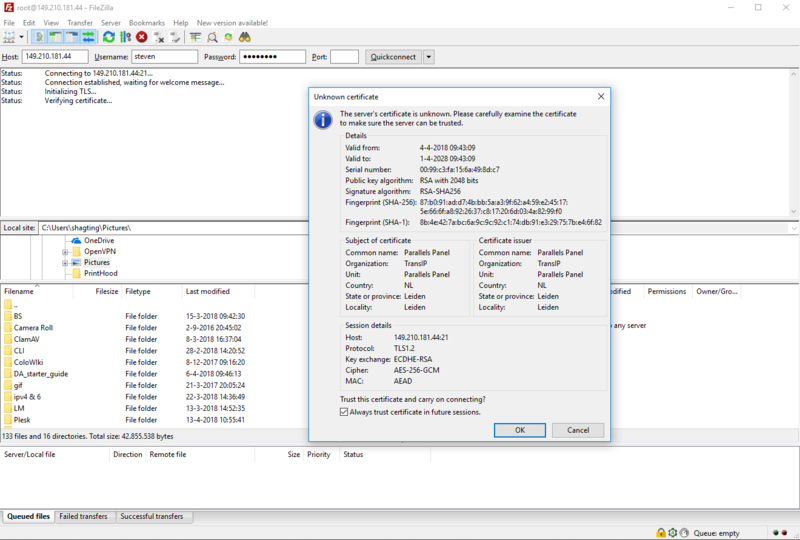 Start FileZilla and click 'File'> 'Site Manager'> 'New Site' and then enter the following data as shown in the example below (but with your own data) and then click 'Connect'. Host: Enter the IP of your VPS. Port: Use port 21 for this. CPanel is configured to use FTPS over port 21. Protocol: Select the 'FTP File Transfer Protocol'. Encryption: Change this option to 'Require explicit FTP over TLS'. This is mandatory and not optional for optimum safety. Logon Type: Change 'Logon Type' to 'Normal'. This allows you to enter your username and password, which is a requirement for connecting to your VPS. User: The moment you add a domain to cPanel you add a user (such as after logging in to cPanel for the first time or adding a new domain in WHM). You use the name and password of that user for FTPS. Password: Enter the password of the relevant user (see user). You will be greeted by a notification as shown in the screenshot below. Select 'Always trust certificate in future sessions' and click 'Ok'. In FileZilla, under 'Local site', navigate to the folder on your computer which contains your website and under 'Remote site', click 'public_html'. public_html: This folder contains the contents of cpaneltest.com. Under 'Local site', navigate to the folder on your computer which contains your website and drag the entire contents to the 'public_html' folder. Your website is now online! If you do not have a database linked to your website, your website is immediately visible online. Log in to cPanel with the account of the user that contains the desired domain and click 'File Manager' under 'Files'. You will see an overview as below. Double click 'public_html' in the middle or click 'public_html' once in the left menu. Pack your entire website in a .zip or .rar file and upload it with the 'Select File' button. Then click 'Go Back to…’. If you have used the second option in Step 3, you can now extract the file from the File Manager. Select the .zip or .rar file and click on 'Extract' in the top right menu. Finally, remove the .zip or .rar file by selecting it and clicking on 'Delete' in the menu at the top. Your website is now online! If you do not have a database linked to your website, your website is immediately visible online. If you use a database, continue with the steps below. Log in to cPanel and click 'MySQL Databases' under 'Databases'. 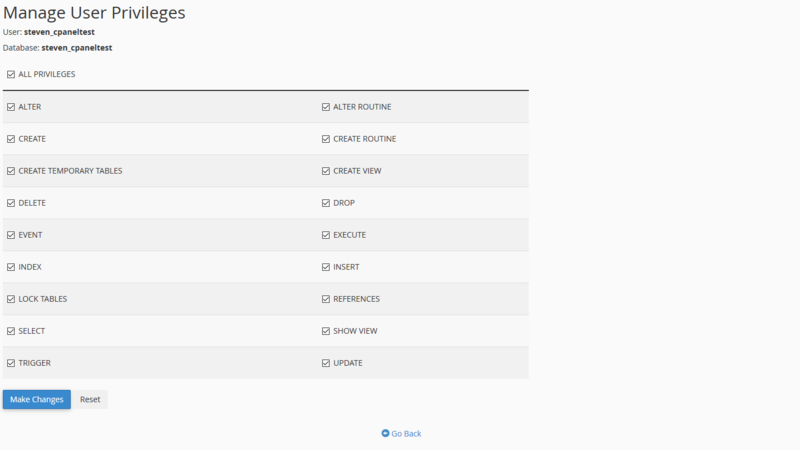 Enter the name of your new database under 'Create New Database' and click 'Create Database'. For security reasons, we recommend that you create a new SQL user for each database. Under 'Add New User' enter the name and password of the new database user that you want to link to this database and click 'Create User'. Click 'Go Back' and finally connect the new SQL user to the database by selecting the user and database under 'Add User to Database' and clicking 'Add'. Select 'ALL PRIVILEGES' and click 'Make Changes’ unless you are certain that, for example, select and insert are sufficient (the ins and outs of SQL privileges are outside the scope of this manual). For the management of databases, cPanel uses phpMyAdmin. Follow the steps below if you want to import an existing database. 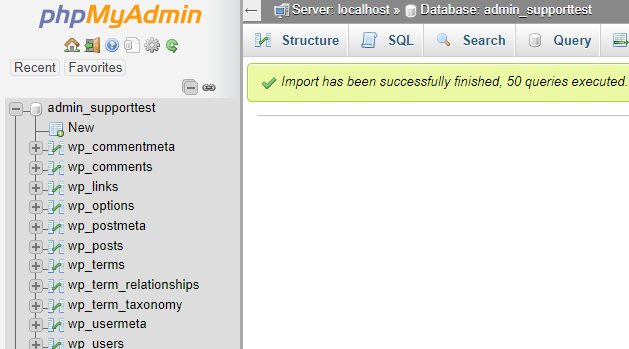 Log in to cPanel with the account that contains the domain for which you want to import the database. Then click 'phpMyAdmin' under 'Databases'. CPanel automatically logs you in when you click phpMyAdmin from CPanel. You will then enter the main screen of phpMyAdmin. Click the name of your database at the top left and then click on 'Import'. In the example below this is 'admin_supporttest'. 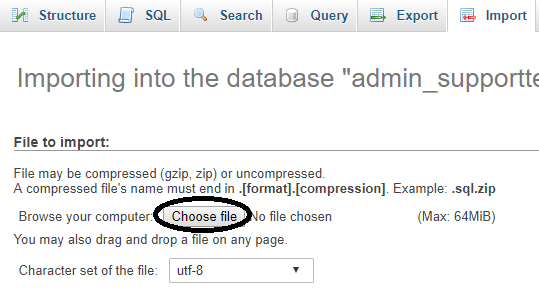 Click 'Choose file' and select your database on your computer. Click 'Go' at the bottom left to upload your database to your VPS. You will see a success report and you will immediately see the tables in your database in the left view. Please note: if your site uses a database, do not forget to check the configuration file on your site (e.g. wpconfig.php) to set the correct database name, database user, server, and password. CPanel offers an add-on for installing WordPress to simplify the installation. To install WordPress, you use the WordPress addon within cPanel. This addon is not enabled by default and you first enable it in WHM (in the steps below). Log in to WHM and find 'AddOn' at the top left of the search field and click 'Install cPAddOns Site Sofware'. On the page that appears, select the WordPress add-on as shown in the screenshot below and click 'Update cPaddon Config'. Now log in to cPanel, scroll down to 'Applications' and click 'WordPress Manager'. In the event of a new installation of cPanel, you will see the overview below. 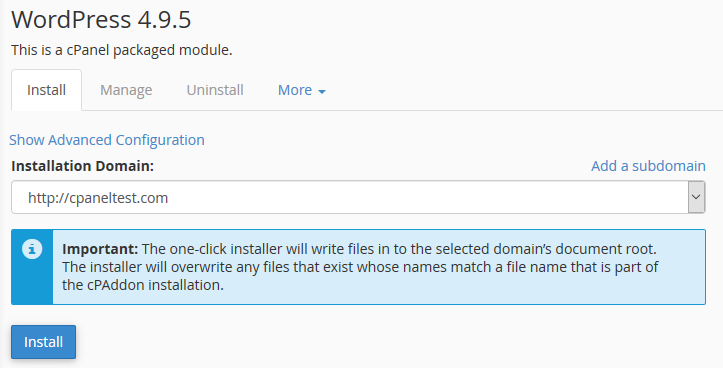 Click 'Create an installation' to start the installation of WordPress. Select the domain on which you want to install WordPress and click 'Install'. WordPress automatically creates a new database and database user during the installation. 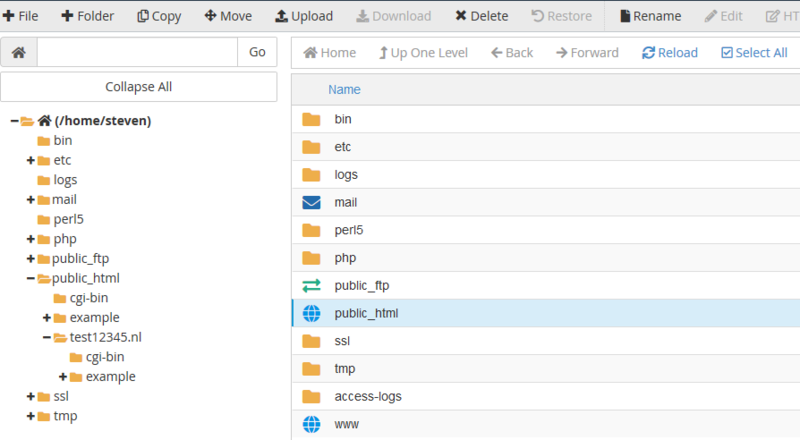 After installation, you will see the username and password of the WordPress admin environment as shown in the screenshot below. You can now get started with your WordPress website right away! Your website is now accessible to the entire world! Proceed to the next section ‘Part 6: Creating and using email addresses' to, amongst other things, create email addresses for your domain and to find out the email settings for your domain, or go to Part 7: Additional articles and other questions if you do not use email for your domain. Should you have any questions left regarding this article, do not hesitate to contact our support department. You can reach them via the ‘ContactUs’ button at the bottom of this page.